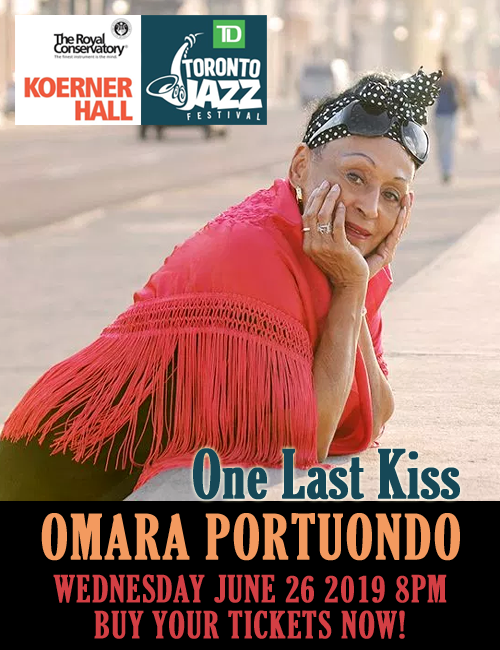 Renowned jazz masters perform together for the 1st time ever! 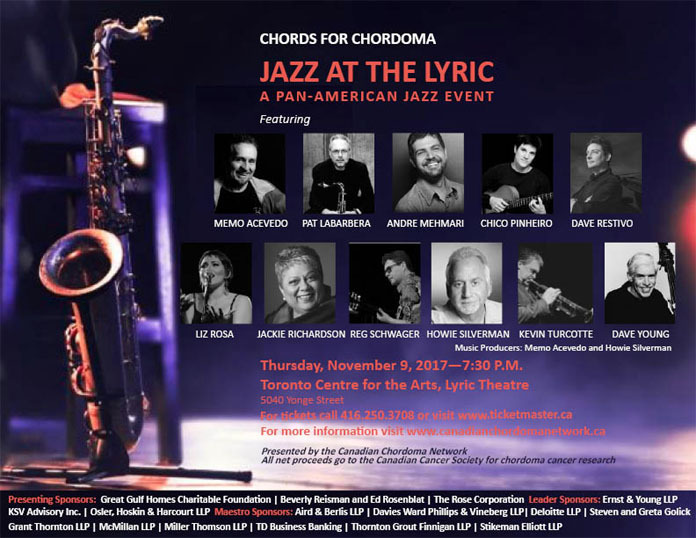 Toronto, Canada – Thursday, October 5, 2017 – Chords for Chordoma, a concert Thursday, November 9 at 7:30pm to 10pm at the Toronto Centre for the Arts, 5040 Yonge Street, in support of cancer research, is bringing together famous Pan-American jazz musicians for a single night event. Tickets are $50 or $100 and can be purchased at www.tocentre.com/events/jazz-lyric or 416.250.3708. The concert will also honour Dr. Janis Sarra for her decades of contributions to the Canadian and international insolvency and restructuring community. The event is organized by Toronto local Steven Golick, who was diagnosed with chordoma in 2012, an extremely rare form of spine and skull-based cancer. After undergoing a complex surgery and 39 daily radiation treatments, Golick founded the Canadian Chordoma Network and has become dedicated to giving back to the medical professionals who help treat those suffering with this rare cancer and to individuals who have been diagnosed with chordoma and their families. “I am bringing together my 30 years of experience in insolvency and restructuring, my lifelong passion for jazz, and my belief that we need to strongly support cancer research with a very special concert,” says Steven Golick, Founder and CEO, Canadian Chordoma Network. Chords for Chordoma will feature 11 jazz artists with impressive pedigrees, many of whom have played with the likes of Ella Fitzgerald, Frank Sinatra, Tony Bennett, Ray Charles, Oscar Peterson, Chic Corea, and Dizzy Gillespie, and performed on the great stages of the world and TV, including Ed Sullivan and the Tonight Show. Performers include: Memo Acevedo, Pat LaBarbera, Andre Mehmari, Chico Pinheiro, Dave Restivo, Jackie Richardson, Liz Rosa, Reg Schwager, Howie Silverman, Kevin Turcotte, and Dave Young. In recognition of Dr. Janis Sarra’s accomplishments and contributions, the Canadian Association of Insolvency and Restructuring Professionals, Turnaround Management Association (Toronto chapter) and Annual Review of Insolvency Law are all co-sponsoring Chords for Chordoma. The Canadian Cancer Society and the Chordoma Foundation are also co-sponsoring the event. All profits from Chords for Chordoma will go to the Canadian Cancer Society to benefit Canadian Chordoma research. Sponsorships or donations can be made at https://canadianchordomanetwork.ca/sponsor-our-event. The Canadian Cancer Society will provide tax receipts to Canadian donors. “Researchers are doing great work but need funding to translate their findings into new therapies and we need your help to make it happen,” says Golick. ABOUT Canadian Chordoma Network: The Canadian Chordoma Network is a not for profit corporation dedicated to developing a community of Canadian chordoma patients, their families, friends and caregivers, increasing public awareness and promoting and funding research into the causes and treatment of chordoma. ABOUT Steven Golick: Steven Golick is a retired partner in, and former chair of the insolvency and restructuring group of, Osler Hoskin & Harcourt LLP. He is a former Vice President International and director of the American Bankruptcy Institute, former director of INSOL International, former member of the Insolvency Institute of Canada, former fellow of the American College of Bankruptcy and a former chair of the Ontario Bar Association Insolvency Section. Golick is the Co-Chair of the Patient and Family Advisory Council at the Odette Cancer Centre and a member of the Quality Committee of the Board of Sunnybrook Health Sciences Centre. In 2013, he was the recipient of the Queen Elizabeth II Diamond Jubilee Award in connection with his contributions to the community, including his role as a co-founder, director and secretary of Kids Help Phone. In 2017 he was awarded a Lifetime Achievement Award by Kids Help Phone.